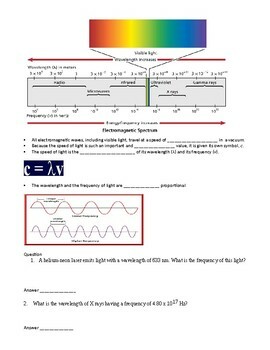 Covers Electron Configuration, Quantum Chemistry, Guided Notes following PowerPoint and more. This is a bundle that has everything you need to teach electron configurations. 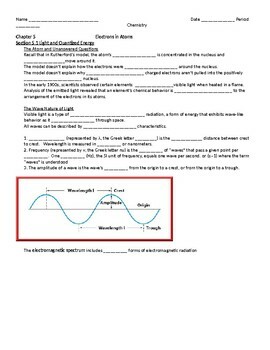 You will get a PowerPoint presentation, Guided Notes that go along with the PowerPoint, Flame Test Lab for students to see how electrons emit light as they jump energy levels, Practice sheets and a packet for further student study. 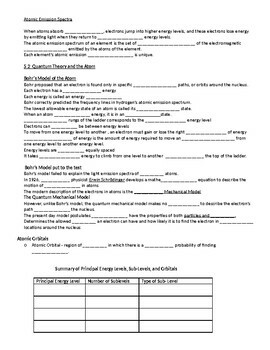 Students will answer questions about energy levels, sublevels, and orbitals. 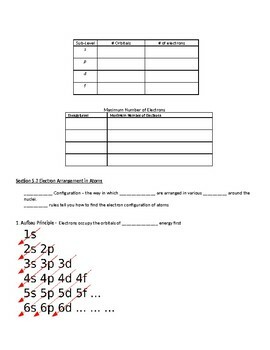 Students will write electron configurations for different elements, identify the valence shell, determine the number of valence electrons, identify the quantum numbers, shapes of orbitals, how to fill using Aufbau Principle, Pauli Exclusion and Hund's Rule. 1) Students enrolled in chemistry. 2) Students in grades 9-12. You will receive in this bundle downloadable handouts that are ready to be copied and passed out to your students to fill in the blanks as you discuss the PowerPoint.